Soldering iron to copper is not much different than soldering a piece of copper onto a copper fitting. The only real difference is that you will have to use a dielectric union at the point where the copper pipe joins the iron pipe. A dielectric union, which is similar to a regular union used on iron pipe, allows you to join two different metals together. It is insulated between the iron and brass/copper fittings, ensuring that the two metals don't touch. If you tried to join these two different metals together, eventually the weld holding them together would break. Make sure to chose a dielectric union that has either a "male" or "female" threaded fitting on one end. Which one you choose will depend on what you need to connect the copper pipe to. Take your fitting brush and braze the end of the copper pipe that you wish to connect to the iron pipe. Brazing is the same as sanding. This step helps to clean the copper of any debris and imperfections. Unscrew the dielectric union. You will now have a copper side and a iron side. Set the iron half to the side for now. 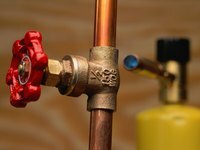 Using your propane torch heat the area where the copper pipe and the dielectric union meet. While heating the pipe and fitting, apply the solder to where the copper pipe and the dielectric union meet. As the area heats up, the solder will slowly melt and fill the gap between the copper pipe and the dielectric union. Thread the other half of the dielectric union back onto the copper half after the fitting has cooled down. Thread your iron pipe into the threaded end of the dielectric union. Using a propane torch can be dangerous. Take the proper safety precautions.